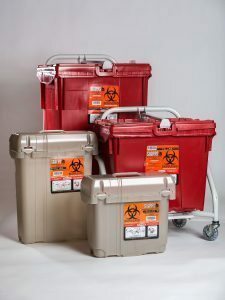 ASI provides reusable sharps container services as well as on-site technicians to exchange the containers so your staff does not have to handle them! A reusable sharps container exchange service is a safe, sustainable and affordable system for the management of needles and sharps. Our company offers a solution to sharps management that has been proven safe and effective through both third party studies with over 20 years of in-hospital experience. The reusable sharps system utilizes reusable containers for the containment of needles and other sharps. This is an excellent way to reduce the amount of waste being processed as regulated medical waste. The reusable containers have less of an environmental impact because you are only disposing of the waste inside of the container, and not disposing of the plastic container itself. After the waste inside the container is disposed, the container automatically opens, is emptied, then is hygienically washed and ultimately is disinfected prior to being put back into the inventory for reuse. 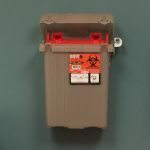 As a value added to our service, we can provide a sharps service technician that handles all of the exchanging of sharps containers. This not only reduces your staffs’ exposure, but reduces their workload as well. We install the container brackets for our customers throughout their facility. We install them where the current containers are being used, and using existing holes in the wall about 90% of the time. This minimizes the need to patch and paint the walls. We also track the plastic diversion from the medical waste stream. We are able to calculate how much plastic is diverted from the regulated medical waste stream due to the reusable sharps container exchange services. This is calculated and summarized monthly for our customers participating in this program. We are committed to assisting you with the safest and most clinically accepted sharps management service in the industry. Please call our office at 302.533.6858 to speak with a Reusable Sharps Specialist!